Reserve Bank of India (RBI) has released recruitment notification for the post of RBI Grade B (DR) General Officer on 3rd July 2018. RBI Grade B 2018 exam has a three phase selection process. RBI Grade-B Officer Phase-I Exam was conducted on 16th August 2018 and Phase-II will be conducted on 15th September 2018. As the exam is nearing its conduct, RBI has released the RBI Grade B Phase 2 Admit Card 2018. Then, click on the Admission Letters link for Phase 2 Examination of RBI Grade B. Check here RBI Grade B question papers of past few years for practice. Check Previous year’s RBI Grade B Officer cut off marks here. RBI Grade B Admit Card printout. Original and photocopy of valid photo ID proof. 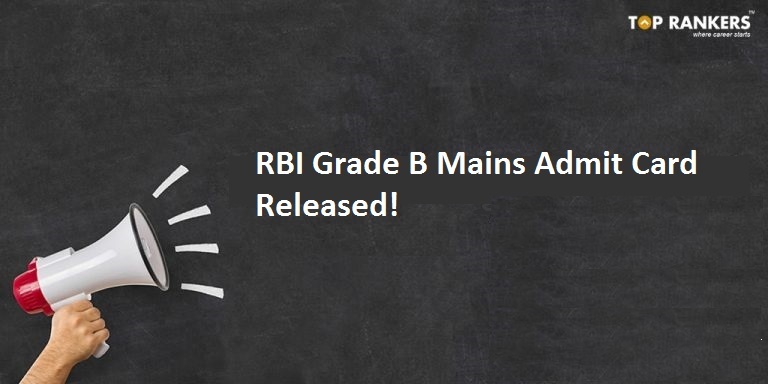 We have mentioned all the eminent information of RBI Grade B Admit Card 2018. We are sure that you are working hard to clear the RBI Grade B Examination, and hence, we are confident that your efforts will be rewarded. Just keep going!